Let’s face it, RVing mishaps are inevitable. No matter how many years we’ve been on the road, most of us have probably endured at least one of the embarrassing mistakes listed below. When it happens to you, take comfort in knowing that every RVing mishap eventually leads to a great campfire story. Every safe and uneventful RVing adventure starts with repetition. Routines are phenomenal ways to ensure your ship sets sail without a hitch. If you travel with a partner, try divvying up the duties into “inside” routines (like securing cabinets) and “outside” routines (like unhooking utilities). Sure, it’s sad to say goodbye to new and old friends but save the farewells for your goodbye party the night before. RVers should know better, however, many times well intentioned Chatty Cathys will distract you from the business at hand. Vents and windows are easy to ignore when you’re getting ready to go. The end result could cause water damage or worse. Again, it comes down to making sure this task is given to the “inside duties” person. Manual entry steps are easy to forget when you’re preparing to move. A total walk-around before you leave prevents embarrassing stair damage when you pull up curbside. Scissor jacks are good at hiding out. It’s likely that every RVer with manual rear scissor jacks will forget to retract them at some point. The damage can be so severe that it ruins your jacks and warps your frame. I know, because it happened to me (see above). Every RV trip departure requires things to go up, down, inside and out. Antennas and satellite dishes are one of the most common items that people neglect to inspect before moving. Just like scissor jacks, it takes extra effort to look up on the roof and ensure that equipment is stowed. The laid-back RVing lifestyle takes a bitter turn when weather goes bad. While outrunning a storm works in the movies, it’s a dumb idea when you’re pulling your ten-thousand pound home on wheels. Keep a close eye on the weather and play it safe to avoid putting yourself in the middle of Mother Nature’s wrath. Did you ever turn up the radio when you heard a strange sound coming from your car? You might be able to get away with it in a passenger vehicle, but ignoring strange sounds in a RV could lead to expensive damage. Investigate noises quickly or pay the price. If you like to boondock in public forests you’re likely to encounter low tree branches, rutted roads and soft sand that can swallow RVs whole. Even if other campers say your RV will be fine in that new camping spot, always take time to park your rig and do a quick walkaround before driving in. The roof you save could be your own. Have you ever seen RVers pull into a campground and drive around a half-dozen times until they choose a spot? Those campers are suffering from “perfect spot syndrome.” We all dream of the beautiful lakefront campsite depicted in REI catalogs but the truth is there is no perfect spot. Every campsite has pros and cons. Once you can accept this, the real magic happens and a memorable journey starts unfolding in front of you. This is just a short list of the best top ten RVing mistakes most of us will make, if we haven’t already. When it comes to specific RV makes and models, the list of dumb RVing mistakes grows much longer. If you want to confess some of your own, do it below in the comments section. We promise we won’t tell! Doh! That is really gross, but yes, it happens. I’m not sure we’ve ever been ankle-deep but even a little is icky! At one point I parked the trailer on boards. When I pulled away the board raised up and took the black fitting right off. Went back on, no problem, but the camp site we left was a sh*tty mess, and nothing could do about it. Got the drip rail on the side of my rv wedged on the edge of a retaining wall at a dump station. Rube Goldberg couldn’t have set it up any better. I could not go forward or backward without scraping the side of the rv. Finally all I could do was gun it and pull away as carefully as I could. $ 10,000 worth of damage later all I could do was grit my teeth and sigh. and resolve to be more careful the next time. Ohhhh Mark, that just made me cringe! Yikes! I’m so sorry. We had a similar incident, which I didn’ mention. We parked too close to a curb and when we pulled away our stairs scraped alongside the curb, sparks went flying everywhere and we almost lost them. These incidents are definitely learning experience aren’t they?! Could you have let air out of the opposing side tires? I did that same expensive mistake myself. I too realized that it was a wake up call to be more careful in the future and not to be to overconfident of my driving skills. I try to be cautious about my surroundings, I was backed into a campsite, walked around to see if everything was all right, lowered landing gear, started raising up off of 5th wheel, pulled 5th wheel latch lever. The neighbor next to my campsite was seating in his lawn chair yelled at me, Nice setup you got. started talking to him, showed him the inside, all what I had done and built, (40ft. enclosed trailer gooseneck, I built living quarters in) he said well better let you get set up, noticed the truck was closer to the street more than I felt comfortable with, so I decided to move back about 2ft., walked to the rear of trailer to make sure I had room, raised landing gear up about 1inch off of pavement, (campground had paved sites) started backing up, feathered brake a little, BOOM!!! trailer slid off 5th wheel, luckily I didn’t raise the landing up too high, when the truck sprang up from the springs, I just missed hitting the bottom of the gooseneck about a 1/2”, could have been bad, expensive and embarrassing. RULE IS, finish what you are doing before chatting. Ohhhh wow! Yes I agree, those little interruptions can be all it takes to do some major damage. Glad yours wasn’t too serious. Thanks for sharing! I installed a BlueOx bed saver on the 5thwheel hitch. Should you high hitch or something it catches the pin before the camper hits the truck box. saved me at least once. Thanks for the tip, and for reading. Power Flusher and Fresh Water Connections were close together. Hoked up hose to flusher. Got distracted talking to neighbor until Black tank blew out bottom of 5th wheel and Brown stuff flew out the vent pipe on top. Hooking up toad to Motor Home. Distracted by friends trying to help. Forgot Emergency brake in toad was on. Started out dragging toad with rear wheels locked. Lucky I noticed dust behind me and stopped before and real damage was done. Gravel road. It’s too easy saying “’cause of the neighbors”. I tend to chat too easily and too often – but I learned a long time ago – when I had my then-young children and felt that I had to present them with a good role model. I didn’t want my kids blaming others when it was partly (mostly) their fault. So when chatting made me forget to do things I pointedly took the blame. I could have delayed the chat session. I didn’t start that early enough – ’til my son was about 3 and oldest daughter almost one. And so it took MANY years, until my son’s adult years, before he stopped using excuses “Jimmy was talking to me” and admitted that HE was talking with Jimmy – and that he could control that. I once saw a big Class A coming to an intersecting roadway trailing a large plume of smoke. When the roads intersected I saw a jeep behind the Class A (When the smoke cleared) with the rear wheels locked and the rear tires gone along with the lower 1/3 of the aluminum wheels. Bad day for him! Eeeek! That’s a REALLY bad day! Yes a Bad Day and here is another. Hooked up toad and thought the steering wheel was unlocked. I moved the steering wheel to be sure. I then turned the key the wrong way in the lock. The first corner I went around the steering wheel locked with the wheels turned. The motor home kept pulling to the right. I stopped at a freeway off ramp and checked the Motor home front end and could find nothing wrong although the passenger side tire looked a little low. I drove 150 miles on the freeway before I stopped at a rest area, and checked everything out. That is when I found the steering wheel on the toad locked with the wheels turned to the right. 2 brand new front tires with less than 200 miles on them ruined. I had road hazard insurance on the tires. Lucky for me they were replace free. Ouch! That’s a “good one” if there is such a thing. Glad you have a great road hazard plan. Yes the road hazard guarantee was on the tires only. I paid $10 a tire extra for it. Sure glad I got the tire hazard warranty, it saved me $190 for the tires. mounted and balanced. Lucky there was no damage to the rims. It could have been worse. Blah. There is a perfect campsite. And I’ve found them because I refused to settle and drove around. Always make sure to clarify road signage, map and GPS before you take the “road not taken because you might not come back”. We did not do this in San Miguel del Allende. Even the Churchs’ book “RVing in Mexico” said to be sure not to take the wrong road (the one we took). I had the GPS set to car and not to RV and Elaine said we should take the left hand road to Hidalgo. She went along with my reading and had to back half a mile up a narrow twisting road with a half mile of locals backed up in both directions. This was Mexico and folks just waved at our predicament and helped us out. Oh holy smokes, glad you got out of that one safely. You have a great story to tell now! I have personally witnessed a poor sap do that in a rest stop parking lot when he unsuccessfully tried pull a brand new trailer around a flat bed semi (ouch!). Plan ahead, keep scanning your review mirrors and drive SLOWLY! Bought a wonderfully maintained 97 diesel Airstream pusher. Everything worked, nothing leaked, and I was very happy on my first long trip in it to Florida. No problems till I got to Ft. Lauderdale where a friend had just bought an older house that had an RV site with connections. It was a 30amp plug so hooked up and everything started going haywire!!! Low voltage blew up the microwave, TV, and battery charger. Needless to say I now have one of those heavy duty voltage supressors to avoid that type damage again. Its like insurance, hard to live with it but you really can not afford to live without it! Yikes! That just sounds so painful Mike, I’m really sorry. It took us eight years before we got a voltage suppressor, I’m so fortunate we didn’t endure the same ordeal before getting ours. I learned to never leave an awning down when you leave on an adventure. Lucky it didn’t happen to us but to unlucky neighbors at a campsite. When they first pulled up to their campsite we could see that they, along with their brand new pull behind, were new to this experience. We watched as they tried to figure out the various things needed to set up camp. They then left leaving their awning pulled out. About an hour later heavy winds starting blowing their awning up and down. I walked over intending to raise it for them, it was a manual operating system, but when I got close a very large dog that I didn’t notice before charged at me to the end of his chain. I couldn’t get close as much as we tried. By the time the new owners arrived the awning had one arm ripped off the side of their new trailer and was actually laying on top of it now. At a camp site we watched a RV with car in tow park at a site down from us the sites were level but on a hill. The guy unhooked his car from the RV but before he could run around to hit the brakes the car rolled down the hill and off a drop into the woods finally stopping when it hit a rock. After a tow truck hauled it back up the hill was surprised he didn’t suffer much damage but did delay his leaving for a couple of days while it was getting the car worked on. One thing that irks me with some comments….we have all been newbies at some point….when we see a misfortune in the making why some folks rather watch than offer a helpful hint. Granted some people are their worse enemy but that is beyond the norm. Personally I rather be helpful, gain a friend and feel good about myself for assisting rather than “enjoy” an amusement at someone else expense. For me that makes for a more interesting camp fire story. I really appreciate what you had to say. At times we run into someone who doesn’t want any help or neighborly suggestions. To lessen the potential for someone being offended by your offering to help, you can simply say: ‘I learned something recently. Do you mind if I share it with you?’ It let’s the Newby keep his dignity, but gives him the chance to keep from needless damage to his rig. Many good-hearted campers will remember that old saying called…… ‘the Golden Rule’ …Mtt. 7:12 ……. Ahhh – loaned my RV to my sister and her spouse. Her spouse’s father (an experience RV’ing) said he would be there to help set up my RV. All was well until they realized that the floor was starting to flood. Forgot one of my setup rules – ensure pressure reducer is inline before turning on the hose. Luckily they found an RV mechanic who made RV calls – a couple thousand later. before they called me!!! I was pulling our trailer through a small PA town one day and saw a perfect four car spot to park into so the family could pop into a lunch spot for a meal. I was happy with the way I menuvered smoothly into said spot,only to find as we got out that a No Parking sign off the curb stuck out into the street just at the height of our awning rubbing it down half the length and ending in a smushed tear at the roller end. I learned a lesson to see things at a different level after that for sure,and it has stuck with me through two other tow rigs and now a motor home. Ken – This reminds me of something that happened to me. I was returning a book to the local library. The parking lot at the library is small and inconvenient for a motorhome, even the Class C 24 footer we had then, But there was room on the street. Great! I parked about 7 inches from the curb – and crunched the front right corner of the over cab portion of the motorhome. The problem was that the crown of the road had me tilted so far that I hit the power pole that was 8 inches the other side of the curb. The crown of the road tilted the motorhome 15 inches. Nothing like discovering that your TT has become an indoor pool. Got all set up at a site, plugged in and hoses connected. Water on… so far, so good. Was setting up outdoor gear when I heard water running… then saw that it was coming from the bottom of the trailer. Gray tanks full to overflowing… bathtub, sink, kitchen sinks all had water turned full open. It took 4 days to completely dry it out, using shop vac, hair dryers, floor fans and dehumidifier. Added to checklist!!! Recently, after we were about a mile from home, on the highway, a motorist flagged us down. When we pulled over, we found that my husband forgot to unplug the electrical cord and had dragged it behind us. Fortunately, there was no damage, just embarrassment. He obviously did not do the MANDATORY “walk around” prior to departure! Nightmare stories! We just completed 20,000 miles in 9 months in our 2014 20′ Airstream Bambi. No big mistakes, embarrassing for sure, but some could have been disastrous. Believe me, we check and double check everything as much as we remember to do so. I agree that one of the biggest problems is chatting with others. Always causes problems. Can I claim an ‘almost senior’ moment? We actually drove around the park heading to the exit when another RVer waved us down to tell us we HAD NEGLETED TO PULL THE BEDOOM SLIDEOUT IN!!!!!!!! We are still saughing about that one. Campsite neighbors recently were hooking up their TT to leave the campground and one of the kids pulled the wheel chocks before the tow vehicle was connected. Luckily, no one was hurt when the trailer slid off of the block that the tongue jack was resting on. Not all those protective cement protrusions at the fueling stations are the same length. I turned to quickly in a very tight station, and got caught in the steps. Just glad it didn’t hit in front of them, or behind them. Embarrassed, and upset at the same time. I was in a crowded gas station fueling up my 37′ diesel pusher before hurricane Irma (?) and paid too much attention to the nose and parked cars when leaving. Put a real nice scrape down the side of my rig and took out a docking light on one of those vertical concrete filled pump protection pipes. Lesson learned. I learned by experience to chock the wheels on my 5th wheel NO MATTER HOW LEVEL THE CAMPSITE LOOKS . Just $900 to replace the tailgate on a year old truck. We turned a corner too fast, not wide enough! Problem was I was being followed and worried about being in the way of driver behind me, so wanting to not cause any inconvenience, I took right turn on a corner that happened to have a 2′ deep ditch of road and wam, passenger side of back tire end went into ditch; we did not notice damage til parking it at our home. Back end cap fiberglass edge was cracked about 2′ worth from bottom, spare tire holder bent, and slide bent but not the seal. Still, the damage was pricey! We have been able to use it but have waited til this next week to finally get it back fixed to its original condition, or close to it. yikes! 2nd Learning Experience: We filled the wrong tank (thought we were filling fresh water but we were filling No Fuss flush or DUMP tank). We chose TANK, should have chosen Normal. We thought we knew the correct entry point but ended up choosing ‘tank’ thinking that meant fresh water (we learned it means dump tank). The choices to turn the dial to were: City, Tank, Or Normal. Our manual did not explain the differences and we are ‘dummies’ so far so our choice was tank. Toilet overflowed, as a result, water also entered the heat vent next to the toilet when it overflowed from toilet. We immediately shut water off, came back and dunked towels into vent, wrung out, dunked more and so on til most of water was out of vent. We get the RV back this week and hope no addl. damage was done to the vent. Tom, so sorry to hear about your mishap! One of the hardest things for nice people (like us) to learn is to not worry about the guy behind you, who may, or may not, be in a big hurry. (Unless of course, it’s an emergency vehicle) I find that most, but not all folks are understanding, and those that aren’t, well we just can’t let them bother us. It’s not easy sometimes, but sometimes it’s what you have to do. I guess to put it bluntly, don’t let some jerk jeopardize you and your family’s, (and your property’s) safety. Two other things I would like to mention. 1. You bought a very expensive piece of equipment, and whether it was used or not, purchased from a dealer or private seller, that seller should have gone over every aspect of operational systems with you. Especially if it was a dealer, and even more so if it was brand new. (Just my opinion) If I were you, I’d go over your unit inside and out, and make a list of everything you’re not sure about. Go back to the seller if possible, ask fellow rv’ers, join a club or forums such as this one, and ask a lot of questions. USE A NOTE PAD! Take a lot of notes. Make pre, and post trip checklists. Make winterizing and de-winterizing check lists. And buy yourself a nice little label maker. Staples carries some nice Brother models (Can I say that here?) and you can get different color tapes, use different fonts, etc, so your labels look professional. Campers are some of the nicest people in the world (most anyway) and are almost always willing to help. Don’t be afraid to ask what may seem like a dumb question. We’ve all been there, and we never stop learning new things. 2. I sure hope your unit was insured. 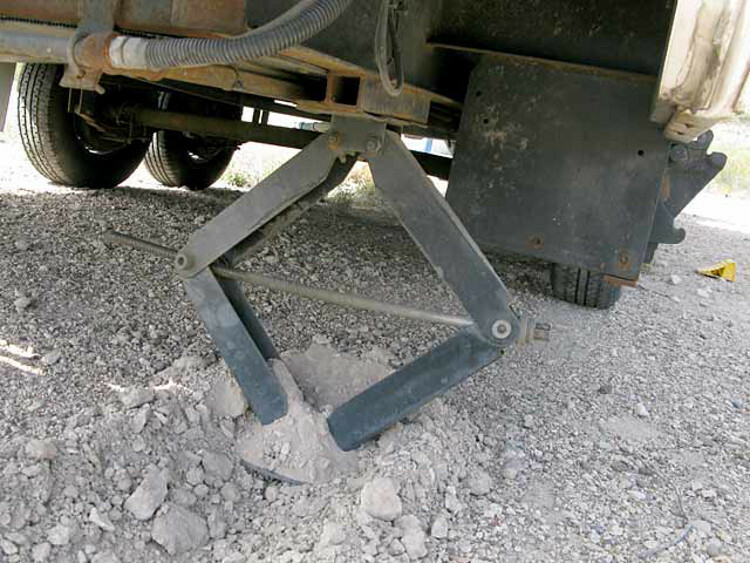 This is an important lesson for newbies: ALL trailers track inside the tow vehicles’s wheel track. So, things like curbs, fences, buildings, power poles, etc. that the tow vehicle will easily clear MAY NOT be the case for the trailer. Add extra clearance when making the turn, and WATCH the trailer in your mirrors and slow down so you can stop quickly if things go wrong. I have already posted a rest stop parking lot incident where a person weaving around a flat bed semi did not allow this clearance and put a very expensive gouge into his brand-new trailer. I was used to towing a 12 foot pop up camper, single axle. I could pretty much thread a needle with it and could maneuver it like nobody’s business. Well we went out a purchased a brand new Jayco Hybrid with double axles. It was late in afternoon and now early evening by the time we signed all the paperwork. We decided to go to one of our favorite Italian restaurants. Wife says “I will follow you, will you be ok taking the trailer in there?” Sure, no problem!!! It’s a Tuesday and there should be plenty of room in that parking lot. Pride commeth before a fall!!! Pulled into the lot and it was PACKED! I have no way out now, can’t stop and back up, I am screwed. I get around to the back and make the turn and now I am not used to the way a double axle trailer turns and I am 2 inches away from clipping a car in the parking lot. A guy comes running across the parking lot yelling “STOP” – well I am already stopped and he is still yelling. I got lucky, I was able to back up just enough to reposition the trailer just enough to make the turn. I got the trailer safely out of that parking lot and took it over to a large empty lot next door. My kids still like to tease me about that one! NOT watching that 10 – 15 foot overhang behind the drive wheels at the gas pump when pulling out. Really dumb and believe me I still cringe when I remember it. Was at the outer banks of North Carolina and couple of years ago and a beautiful duel axle diesel pusher pulling an enclosed car trailer arrived one afternoon. After check in, he decided that it was not necessary to unhook the trailer and back in when he could just go down the road behind his site and pull through the sand. By the time the kid got out to check, the motorhome he borrowed from daddy was dug in to the axles. Took a crew with tractors and shovels until nightfall to get him out. After paying for the damages, he was allowed to stay till the morning but was ask to please vacate the park and enjoy his stay somewhere else. #1. My ex was helping me back up. It went something like this:. “c’mon back, keep coming, keep coming, keep coming, #BANG!!#,…. “STOP!”,. #3. I opened up my pop-up to show it off to my friend. As we walked inside, I walked towards the back of the camper. Suddenly, instead of the trees outside, I saw the.ground. #THUNK!#. I turned around & saw my friends waist as he was now 2′ higher than me. Looking further up, I saw his shocked & confused expression. I knew instantly what had happened: I slid bofh sides of the pop-up OUT, but didn’t set the landing gear which would keep it from tipping up on end with us inside it! I SHOULD have anticipated this, but I did NOT:. The world shifted AGAIN as I stepped towards my friend and #THUNK!# the trailer fell back to its level position. We still laugh about that one & now I always check the landing gear/stabilizers!!! #Bonus:. I bet I’m the only one to have watched their trailer slide several feet to the side as their hitch slipped off of a piece of wet wood!!! ???? I LOVE my farm jack!!!! ???? It’s funny how that little shot of adrenaline can so permanently fix these memories into our brains! No need to besmirch REI. Their campsite photos are pristine because backpackers reached them. It”s the RV industry that depicts RVs in perfect, uncrowded campsites. Never seen one of those yet, but have hiked to plenty of uncrowded sites. 26′ travel trailer. We have had various RV trailers for 45 years. Husband is very conscientious about everything. He put the hitch head into the receiver and then realized he did not have his keys with him to unlock the lock on the pin that goes through the receiver and hitch head. Went for his keys, came back and continued to hitch up. Ready to go and I walked by and always give a glance to see everything looks OK. I thought the head looked like it was sticking out a bit far, but the pin was in and locked so Infigured it was OK. Pulled out, drove about .1/2 km. Stopped at the highway, turned left and 1/2 way into the turn kaboom! We both looked at each other and said what the hell was that? Managed to pull onto the shoulder, jumped out and saw the hitch head slipped out of the receiver. Husband knew exactly what happened! He came back with the keys, but having been distracted out of normal procedure, forgot to take the pin out and slip the head right in and repin and lock! Crossing the chains saved any damage happening. A bit of a procedure to get the trailer tongue up high enough to get it onto the ball but we did it and no damage. We know this will never happen again! Don’t get distracted! My wife and I were celebrating our honeymoon in our fifth wheel. It had been a sunny day and pleasant evening whenever left with the awning out. When we got back about 2 a.m. the stars were out and the moon was shining, so I left the awning out. When I got up at 9 a.m. I couldn’t get the door open. Long story short it had rained and the awning didn’t have enough slope. The awning was full of water that I got out by slitting it with a knife. Of course all the brackets were twisted and bent. It took a total replacement. We never left the awning out on the fifth wheel again, nor do we ever leave it out on our class A motor home. One time was more than enough! I had the same thing happen. It’s AMAZING how much water those awnings can hold!!! ???? How about spending an hour trying to figure out why the furnace stopped working, and then you remember to check the propane tanks!!!!! Haha that’s a good one! Glad it was just an empty tank. Heading out on a much longer day drive then I usually like to do, about 400 miles I complained numerous times to my wife that everyone is driving so rude today and not letting me in and out of lanes. In fact it got so bad, if I wanted to change lanes I would just blink and go as no one gave me any space. I also mentioned to my wife I thought the breaks on the rig may be going bad. Once we got to the destination I unhooked the rig,noticing then that i forget to plug in the 5th wheel wiring harness before the trip began……..
A lot of sad stories – some of which I have experienced. One thing we do now is we use check-off lists for both inside and outside. My wife looks after the inside and I look after the outside. Before we pull away, we question each other about their list. If either of us can’t specifically remember completing a particular chore, it is double-checked. So far so good! In addition to not ignoring strange sounds I would add do not ignore a different picture out of your rear view mirrors. On our way to Alaska last summer and after a bad stretch of frost heaves north of Destruction Bay, I noticed I was seeing a bit more of my driver side of our travel trailer than normal. I mistakenly thought I must have accidentally bumped the electric control for the mirror, so I just corrected the mirror setting. Big mistake! I had broken the passenger side rear axle spring hanger. We pulled that trailer all over Alaska before finally discovering the broken spring hanger in Tok on our way out. A few weeks ago while returning from a trip out West to AZ and UT we had just gotten back on I-10 east of San Antonio when I again noticed I was seeing more of the side of the trailer. This time I did not disregard it and stopped to check. Broken spring on the passenger side of the rear axle.